Can’t wait to get a great harvest of your homegrown shrooms? 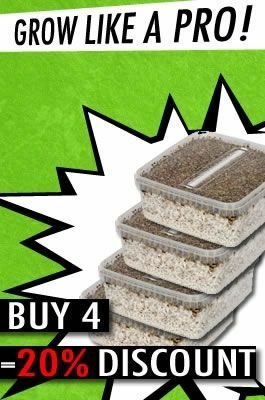 Try out one of our 100% mycelium XL grow kits! This kit has over 2100cc of growing material with harvests of up to 800 grams. All the grow kits can be found below, so review our extensive selection. Be sure to place your grow kit in a bright location: in daylight or artificial light is fine. Do not place it in direct sunlight. The temperature of the grow kit must be stable: between 20 and 25 degrees Celsius. Keep everything sterile: use a face mask, disinfection agent and gloves. Important: wear clean clothing. Any bacteria that you have on your person can ruin your shroom harvest. The approach to each harvest differs for each grow kit. Always read the product descriptions on our website and the instructions that come with your order. One grow kit might require you to be more careful than another. If you learn about it beforehand, you will really enable your grow kit to flourish. Mycelium is the network of hyphae (fungus strands) that is underground. Mushrooms grow from these. The big advantage is that the soil of the grow kits contains 100% shrooms. This results in a great harvest from the grow kits. With our 100% mycelium XL grow kits, growing magic mushrooms at home is very simple. These grow kits have been developed so well that it is unlikely that you will run into any issues during cultivation. How do you store freshly harvested shrooms? Self-harvested mushrooms can be kept refrigerated for several weeks before they go bad and have less of an effect. You want to be sensible about how you handle the harvest of your XL grow kit! Don’t forget to enjoy your first harvest either. Do you want to use the substances for a long time? If so, we recommend drying out the mushrooms and then storing them in a dark, dry place. Would you like more information about this or do you have questions about using our 100% mycelium XL grow kits? Please feel free to contact us!